Sparkle Unleashed is another addition in the crowded genre of match-three shooters. While it doesn't do anything to recreate the genre like Wonderlines or Ruby Blast, I still manage to find some enjoyment when played in half-hour increments. Like other games, Sparkle Unleashed throws you into bright, beautiful maps filled with colored orbs slowly push towards the bottom of the map. There's a launcher at your control that fires similar orbs with the idea that hitting two of the same type will remove the orbs from play. Sounds simple right? Well, it is! 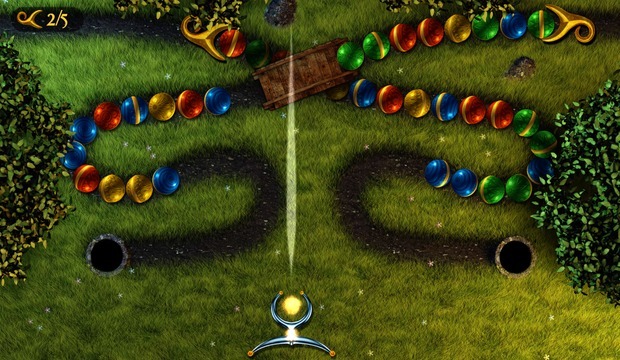 Sparkle Unleashed features over 100 different levels and an endless mode. I was satisfied with the amount of content but found myself getting bored fast. The game does a good job of creating pretty creative scenarios but with some exceptions, each level is the same as the one that preceded it. It does try to throw a few curve balls to stop the monotony but none of the challenges really stand out. With that said there are a few things I did find fun. There are power-ups that appear on the map that let you destroy orbs, slow their travel, and force orbs to go in reverse. The ease of the game makes the power-ups less useful but they are entertaining. I spent most of my time with Survival Mode. As the name states, in this mode you don't clear the stage of orbs to complete it. Just try your best to survive wave after wave of orbs. I found this to be the area of the game that provided the most entertainment. The map design is also pretty neat. Even with the tedious gameplay, I found the maps themselves to be beautifully crafted. Certain levels only leave you with a few opportunities to clear the orbs. So timing and precision plays a vital role in these maps. Initially, the music was a nice addition to each level but after about 12 levels the repetitive tune became annoying. This isn't a bad game by any means. There is a ton of content here and in short burst the game is fun but the lack of innovation is where it falters. With such a crowded market for 3-match shooters such as this, Sparkle Unleashed doesn't do much to stand out, but instead gives us a fun, familiar game, albeit a forgettable one. Sparkle Unleashed, seen previously on PC and Xbox, brings its match-three puzzle gaming to the Nintendo Switch. Similar in design and aesthetics to PopCap’s Zuma, I wanted to cry foul against 10tons for blatantly copying the design of a successful game. But you know what? It has been a long time since I played a match-three game and I found this to be a perfectly acceptable imitation.